The Fenix Corporation security team is dead, a fire has broken out, and there are people trapped on the top floor. You are safe, locked in the security vault, but it is up to you to direct the survivors as they make their way to the ground floor. Unfortunately, the TEMPEST computer planning the escape routes doesn't think everyone can make it out alive. There are tough choices ahead, and you'll be the one to decide. No-One Has to Die is a turn-based puzzle HTML5 visual novel by Stuart Madafiglio where sacrifice is the only way to get closer to solving the full mystery at hand. In each level, you'll be presented with a grid floor plan of people, locations, and switches that can be interacted with, and fire that spreads every turn. Click the arrows to move people, and the arrow in the upper left to advance a turn. When a person is next to a switch, they can turn it on or off. When the switch is on, water will come from the faucet icon, spreading each turn it is on, preventing the spread of fire. People standing on squares filled with water or fire will die. There are doors that, when locked, will prevent the spread of fire or water. However, one door can be remotely locked on each level. The level is completed once the progress of both fire and water is halted. Most levels will require the sacrifice of one or more people to continue. Depending on your choices, new aspects of the plot will be revealed in each play through, though the menu screen will allow you to restart from different branches of the story. With its emphasis on characterization, moral dilemma, and branching paths presenting parts of a larger, complex story, no-one has to die appears to have gotten direct inspiration from 999: Nine Hours, Nine Persons, Nine Doors and Virtue's Last Reward. Certainly, the raw number of plot twists herein could give those games a run for their money, and fans of cerebral jigsaw-puzzle stories will definitely be driven to replay the game until every scrap of information is uncovered. Admittedly, the fire/water puzzles feel perfunctory in comparison to the plot, making one wonder if the game would have been better served as a pure visual-novel. Still, No-One Has to Die is a yarn surely satisfying enough to make even the most meticulous players overlook the blatant inaccuracy contained in its title. No-One Has to Die Walkthrough now available! The spoiler below contains an organized synopsis of NoHTD's entire backstory and story, intended to settle any confusion regarding the plot. Proceed with caution. Fenix Corporation is a company interested in time travel. Using the sale and resale of cheap products as a front, they created the TEMPEST machine. The TEMPEST was a fully functional time machine, with the caveat that it transported one's consciousness rather than any physical object. Transit forwards in time went as expected, with the caveat that the subject was essentially dead during the period their consciousness "skipped". Transit backwards, however, randomly pinged the subject's consciousness into another parallel but nearly identical universe. Of course, since in those universes the same subject was being sent off in the same way, many consciousnesses from the same person flew to random universes, some universes receiving multiple copies of the same consciousness (which caused them to overwrite one another) and some universes never receiving a single one. In rare (and by rare I mean rare; this happened literally less than one time in a million, as you'll soon see) cases, a consciousness would land back in the same universe it came from. The TEMPEST's first test subject was Christina's mother, also named Christina. She was supposedly mentally sent back in time, but no consciousness of hers ever came back to inhabit her body, so as far as anyone could tell, Christina Sr. was dead. Unsure of the reason for Christina Sr.'s death, Fenix conducted a huge investigation into what exactly had happened. Most notably, they conducted the "Phoenix Experiment". They purchased millions of cockatiels, taught them to say a phrase-- more specifically "Christina lives", in honor of Christina Sr.-- and sent them through the TEMPEST, which was set on back-in-time mode. One of the cockatiels was special for two reasons. One: it inexplicably knew the phrase before any of the birds was taught it. Two: when it went through the TEMPEST, it survived as if nothing had happened, whereas all the others died. The birds that died did so for the reasons explained for Christina Sr. above. The special bird survived because its consciousness, by miraculous chance, landed back in the universe it originated from; this was also how it knew the phrase too early. This was the evidence Fenix needed in order to realize how the TEMPEST truly worked (which I already explained up above). Meanwhile, Christina Jr. (the Christina present in-game) received her mother's corpse, sans brain (presumably they cut it out to check for signs of her consciousness). She knew Fenix's work was a front for something, but had no idea what. Furious about what happened to her mother, Chrstina Jr. decided to put a permanent end to whatever experiments Fenix was conducting. She started the fire and shot the security guards, setting up the disaster the playable portion centers around. When the fire started, the TEMPEST's target time was automatically set to the current time, presumably as a security measure to hide what it had most recently been used for. The Visitor, who happened to be in the room to make a delivery, coordinated everyone's escapes, but had to sacrifice three lives in order for one person to make it. Whose life he spared varied between universes, many of which had the same outcome. Whoever survived then wandered into the TEMPEST and was sent back to the fire's start, in another universe. Troy was unfortunate enough to go through the loop five times in a row, being the only one spared each time, to such a point that he declared himself the arsonist just so the Visitor would decide to spare someone besides him, thereby ending the cycle. Lionel's survival was special; when he was spared, he let the Visitor out of the security room and invited him to enter the TEMPEST as well, adding a fifth person to the web of flying consciousnesses. In the final timeline, five randomly pinging consciousnesses managed to land in the same universe by chance (which isn't as unlikely as it sounds, considering the huge sample size). Thanks to the security codes the survivors had picked up before entering the TEMPEST, the Visitor managed to save everyone. Christina Jr. wasn't satisfied, though. After obtaining information from Lionel about the TEMPEST's controls, she used the thing to go back again, once again landing in a universe where no sacrifices were made, then during the escape she modified the TEMPEST to send her back to the time her mother was sent back, knowing there was a chance she'd land in a timeline in which Christina Sr. was alive... and if she didn't, she would jump back again and again until she did. Each spoiler contains that level's walkthrough for each side (left/right). Click the spoiler at the end of the solution you want for the next branch's solution. Turn 1: Lock Troy's door, Lionel moves up and switches water on. Turn 2: Switch off. Steve dies. Turn 1: Lock Christina's door. Flip switch. Turn 2: Advance. Troy dies. Dead end. Advance until death. Turn 1: Lock Troy's door. Flip switch. Turn 2: Advance. Christina dies. Turn 1: Lock Lionel's door. Flip switch. Turn 1: Lock Troy's door. 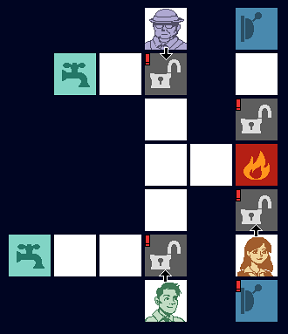 Turn 1: Lock Steve's door, Lionel moves up and switches water on. Turn 2: Switch off. Troy dies. Turn 1: Move Steve right. Lock his door. Turn 3: Advance. Christina dies. Turn 1: Move Steve up. Turn 2: Move Steve up. Flip switch. Turn 6: Steve dies. Advance. Turn 1: Lionel moves up. Lock both doors. Flip switch. Turn 1: Lock all doors. Turn 1: Move Steve right. Lock Steve, Troy, and Lionel's doors. Flip switch. I have to tune out most of the brain-hurting time travel stuff, but otherwise a very good game. The last time I played this game I gave it 5 / 5 mushrooms. I'll give it 5 / 5 this time as well. I would love to see a "level pack" sequel to this game that dispensed with the story completely and just had multiple levels that had to be solved with varying requirements (how many casualties were allowed, etc.). My consciousnesses has come here from another universe where you posted this. Safe to say, you left many a people confused and brain hurt. I suggest getting to the TEMPEST to make sure this is the last time this has to happen, go now and save their brains. The puzzles felt pretty tacked-on after I figured out the first one, but I really liked the story and the theme of the game. The title "no-one has to die" took on many different meanings throughout the game. Why must I keep killing you, Steve?? I'm with SonicLover, this game could use a level pack. It's fine as is, but once you finish all the levels you don't have any more reason to play because the levels are all so similar. Hey SonicLover, have you seen the movie Primer? Christina Jr. is the same person as Christina Sr., somehow. It doesn't seem unlikely considering this game is about transferring consciousness and different outcomes to that effect. zzzzz, remember the function of locked doors. Sorry for the double post, I just rechecked that level. What I should have said is, remember that the flow of water can be stopped. The switches work both ways. I don't know if it's just me, but I could only get this working in Chrome. Internet Explorer froze on "Loading Sounds", and Firefox started playing music but wouldn't display anything. All my browsers are up to date. I agree with the rest. Amazing story but the puzzles were trivial. Still worth one play-through though. This would actually make an amazing movie. Just be aware, if you are dealing with a fire in real life, locking the door won't help. To summarize: Great story, meh game play, some of the best selected music I've seen in a game, played through twice already, where can I get that music? @ecru: Not that I'm claiming to be an expert in the field myself, but what sort of an authority are you on fire safety? I'm pretty sure it'd actually help a lot under the right circumstances. @SonicLover - closing doors would probably help in many fire situations. Locking doors which are already closed probably wouldn't. Actually, I didn't mind the puzzles that much, since I didn't consider them puzzles at all. I just decided they were fancy decision points. Saying that it was similar to 999 and VLR spoiled it for me, though, since I knew what happened in those games. Am I the only one that wishes the conclusion to these time travel stories wasn't invariably to create a new timeline where everything bad is avoided? In any case, it was an interesting read, and it's a good sign when a game makes you wish it was longer. Cub149: I had the same thought. The boring "Everyone lives" thing. It's not true here. Chris jumps backward into the unknown. She's not sure what will happen. I don't consider that to be saving her. They seem to have very good handle on time travel and its effects. Almost better than Doctor Who (Those writers prefer to just stay out of the effect time travel actually has.) And way better than H. G. Wells' Time Machine. Every character end happens when someone enters the TEMPEST machine. If the TEMPEST machine only takes consciousnesses through time, why do their phones lose the connection? @SonicLover: Primer is a sci-fi film that has probably the most convoluted time-travel narrative ever, with multiple branching timelines, doublebacks and simultaneous temporal instances of characters. Your very admirable organization of this game's narrative makes me think you might like to try to make sense of the film. Why does it take 6 million cockatiels for one to fall back in its own universe. Yet one Troy manages to do it 5 times in a row? Six million cockatiels were necessary because they needed one to return precisely to its original universe, i.e. the one that the testers were in. But Troy didn't have to return to the exact same universe five times; he just had to land in universes sufficiently similar to his original universe that he didn't notice any differences in his immediate surroundings. It's the greatest time-travel story I've read. It also ended up an hidden puzzle piece behind the Asimov novel-verse (Robots series, Empire series, Foundation series, their preludes and postludes). These stories intertwine, spanning tens of thousands of years, while The End of Eternity covers - tens of millions. My guess is that the connection dropped because the TEMPEST machine interfered with the signal. Wow, Interesting game! I like plots that include time travel.. although it does get a bit confusing with all the possibilities & outcomes. Nobody actually has to do in the final path. I'm using Safari, and the HTML5 appears to load, but I'm stuck loading sounds. It works fully in Chrome on my Mac (OS X Lion), but I would like to at least know the issue. I just tried loading the game in Safari (6.0.3) on Lion (10.7.5), and the sounds all loaded and played fine for me without any issues. However, once I reloaded the page, I, too, was stuck at "Loading sounds..."
Then I emptied the caches (Develop menu -> Empty Caches) and reloaded the page. The sounds then all loaded and played fine again. You might want to try doing that yourself to see if that works for you as well. Plot driven games are my favie fave. everyone, in fact, died. Despite what the title says. It's just that nobody cares. This building has a terrible sprinkler system. They would've installed a better system, but they didn't want to risk letting the inspection crew discover the TEMPEST machine. @SonicLover: So, what, they're satisfied with a system that drowns people who accidentally step beneath one? Joking aside, I don't really see the problem. The puzzle aspect is just there to connect the seams of the story. It doesn't have to be over-analyzed. I can't play the game. It won't start on my computer. Just the music i can hear. Mmmm... May I drop a little fly in the ointment? Even with all these time-travelling, you can't say "no-one died". Two innocent guards are so easy to forget, right?.. after hearing each of their stories! @Alli Wong: have you seen all the endings? Are you sure? @Fred M Sloniker Yep, the final timeline appeared but I still can't lock more than one door. "When the fire started, the TEMPEST's target time was automatically set to the current time, presumably as a security measure to hide what it had most recently been used for." I'm pretty sure the reason the target time was set to the time the fire started was so that, assuming someone survived, they could go back to the start and fix the issue (i.e. stop the fire/save everyone). Not to hide what it was most recently used for. Really loved this game! its pretty complicated understanding the separate time lines and stuff and its really quite sad too but it was fun! This game is so psycho. It messes with your mind so badly. Why am I still playing. WHY AM I STILL PLAYING. Great game. It gets a bit repetitive but the storyline is interesting. The best part is the OST. before it revealed the TEMPEST machine I actually thought it would be that Christina the mom hadn't died but been transported to present day Christina the "daughter"